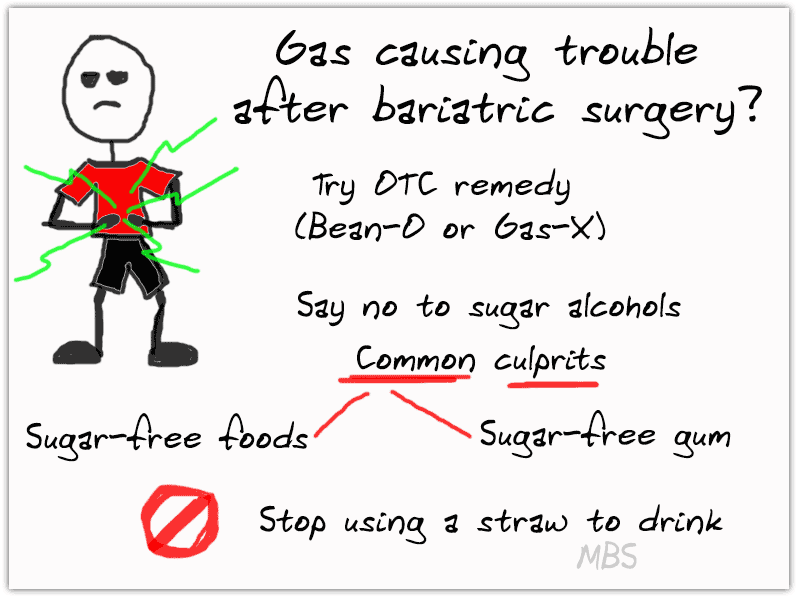 Try Bean-O or Gas-X as an over-the-counter remedy. You may be developing some lactose intolerance. Try lactose free dairy products. Avoid sugar alcohols like sorbitol, mannitol, and xylitol. These are frequently found in sugar-free foods, low-sugar foods and sugar-free gum. Be careful to avoid chewing with your mouth open, swallowing air, drinking from a straw, and gulping/drinking too quickly. Avoid carbonated beverages and chewing gum (sugar and sugar-free versions). Walk as much as you can (as long as the pain is not severe) and that will help to eliminate the gas. Obesityaction.org suggests consumption of probiotic yogurt to ease intestinal gas and flatulence post weight loss surgery. Some of you may experience gas pain/pressure and diarrhea from protein drinks. A culprit for this could be lactose intolerance. Lactose intolerance can develop at different stages after surgery. It is pretty common for it to develop within the first few weeks to months after surgery. In general, people tend to develop lactose intolerance as they get older and surgery can exacerbate that. Look for a soy isolate protein powder/drink. Just blending plain tofu into smoothies also works. Do gas pains bother you after surgery? And do you have any “gas-hacks?” Tell us in comments!